How much abilox® will I need for a project to cover.... M2? please click on abilox® easy dose rate guide pdf for a simplified calculation. 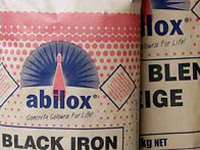 Where can I purchase abilox®? Please view our ‘Where to Buy’ section within our website for further details. Please also note that not all agents carry our full range of products. Our head office and warehouse is situated in Melbourne. Can Ability send out samples of abilox® colours? Ability often sends out samples to clients of abilox® colours. These come in different forms depending on client’s needs; these include sample cement ‘biscuits’ or sample packs of colouring pigment. How long will it take to manufacture? Ability stock all abilox® colours ‘on the shelf’ based on our colour specifier at our Melbourne head office and warehouse. For larger quantities or for specially made colours some waiting time is to be expected - please ask our friendly staff for an estimate based on your requirements. How do I estimate the quantity of colour pigment required for pre-mixed concrete? Please click on our abilox® how to estimate quantities pdf for a simplified calculation. How do I estimate the quantity of colour pigment required for mortar /render / bagging etc.? In what quantities can I purchase the pigment? and also in 25 kg bags. abilox® does not weaken concrete. abilox® - Ability Building Chemicals' brand of mineral oxide pigments - are used for integral or 'through' colouring all sorts of composite materials - from artists' paints to linoleum but are mainly used in the building and construction industries, to through-colour concrete, asphalt, mortar, grout, plaster and lime materials as well as cement bound building products such as pavers, bricks and roofing tiles. Used in accordance with the manufacturer's recommendations, an abilox® colouring pigment usually produces the required colour uniformly across the whole project, whether it's the driveway of a new home or the exterior of a high-rise office tower. However, there are methods of use involving two or more abilox® pigments which can result in attractive variable colouration if required. Am I restricted in my choice of colour? While there are 60 individual colouring powder pigments in Ability Building Chemicals' abilox® range, the palette is in fact unlimited. If you can imagine it, we can produce it! It is literally possible to produce millions of colours and shades. And we offer a free colour-matching service. If you can provide us with a sample of the actual colour you need such as a piece of coloured brick or tile, a cut-out from a paint colour card etc, we undertake to provide an abilox® match for it within a few working days. Special colours are made to minimum quantity. Unlike organic pigments which are degraded by ultra-violet (UV) rays, abilox® inorganic mineral oxide pigments colour permanently and are not affected by the sun's UV radiation. If our dry pigment colours are used in durable, quality materials in accordance with Ability Building Chemicals' recommendations, then we guarantee them - so you can rest easy! abilox® colours are non-toxic and are safe to use. Also, unlike organic pigments they are derived from renewable mineral resources and not from those that are non-sustainable such as crude oil. Will abilox® reduce the mechanical strengths of concretes and mortars? No. In a given concrete formula or mix design, abilox® tends to marginally increase mechanical strengths - depending on the particular pigment. Some pigments have virtually no effect, with no change, while others if the minimum water is retained in the cement bound material by applying a single coat of Duro-Seel Clear, provide a significant increase. Resistance to abrasive wear may also be increased. Are they difficult to use? No. They are so easy to use and Ability Building Chemicals can provide prospective specifiers and customers with a range of free printed information on every aspect of the use of its abilox® dry pigment colours. This information is written in a simple, easy-to-follow style. In addition, our highly-experienced technologists are available to guide and assist you through every phase of a project, to ensure you get a good, sound 'through-coloured' job. Please click on our abilox®easy dose rate guide pdf for a simplified calculation. Yes. But for the same reasons that you would employ qualified professionals for specialised building and construction tasks like carpentry, plumbing and electrical work, we recommend you use people who are willing to show you examples of their work and are experienced and skilled. This recommendation applies to the pre-mixed concrete supplier who adds abilox® powder pigments to the concrete during its mixing at their production plant to the concreter or concrete placing and finishing contractor. Using an operative or organisation registered with the Building Practitioners Board means the work is guaranteed for seven-and-a-half years, which helps to give people added peace of mind. How are they used in pre-mixed concrete? abilox® ultra-fine particle powder pigments are packed in Ability's Concrete Friendly® Paper Sacks. These are placed in the mixer barrel of a concrete transit truck with the wet 'plastic' concrete raw materials and mixed at the mixing barrel speed for at least ten (10) minutes. At this speed, and for this time, the bags disintegrate and disappear completely; even the sack stitching dissolves! Beneficially this proper mixing process ensures that the pigment grains are adequately distributed or 'dispersed'. Proper pigment dispersion ensures uniformity of colour and the development of maximum colour strength. How do we obtain the intensity of colour required? The intensity of the colour is related to the pigment dose rate, the efficiency of mixing /dispersion and the water to cement (w/c) ratio in the concrete. The lower the water content, compared with a given cement content, the stronger will be the colour at a given pigment dose rate. Because the use of UV-resistant colour enhances the appearance of a building or construction project, it also increases its appeal and its value. That makes abilox® mineral oxide powder colours remarkably cost-effective over the life of the project.The actual cost depends on the price of the particular colourant in the abilox® range. Prices vary from one colour to another because of the variance in the cost of raw materials used in the manufacture of a particular pigment. Our abilox® Colour Specifier brochure has a ‘dot system’ to show price variations at a glance. Can they be used indoors? Yes. Because they are non-toxic, durable and colourful, abilox® colourants are ideal for indoor use. Some home-owners are using abilox® to colour sections of their concrete raft slab - for instance in sunrooms - and dispensing with expensive floor coverings such as carpets. Some architects are designing commercial buildings with coloured concrete floors that are mechanically honed and polished to result in an attractive terrazzo 'look'. The use of integral colour in hard faced wall plaster over brickwork negates the need for painting. Will the colour wear away with use? No, but the concrete, asphalt or other composite if of poor quality may! Mineral oxide pigments - native or man-made - are the most permanent and durable of all pigment types. Most may be regarded as immutable, even in areas of high foot / vehicle traffic, provided the grade or class of pigmented pre-mixed concrete is selected and processed on site to be wear-resistant and durable. Can abilox® be used for a patch-up job? Ability Building Chemicals produces easy-to-understand information on the rectification of problem coloured jobs. We can help you solve difficulties such as poor colour work caused by using cheap pigments, the use of too much water in the cement-bound mix, or concrete which is rain damaged or weak because it was not cured properly.